Now it is easy to book classified ads in Sakshi Newspaper through Online booking process. You just need to follow few simple steps process to get your ad published in Sakshi Newspaper. There are various options available to advertise in Sakshi. The major one are Classified Text Ad, Classified Display Ads and Display Ads. You need to understand the difference between this three before choosing the option. Once you understand and choose the right option and complete the ad booking. Go to Sakshi Ad Booking Page. Check out editions list with Ad Rates mentioned for Sakshi Newspaper. You can select individual edition or available package for Sakshi Newspaper. Select desired date from the Calendar to publish your ad in Sakshi. You can also choose Special offers if you wish to advertise for multiple days. Finally, Review your ad booking for Sakshi Newspaper and register yourself then pay online through Debit Cards, Credit Cards or Net Banking. After you successfully make payment you would receive a booking confirmation email from us. Post editorial review your ad would get published in Sakshi Newspaper. 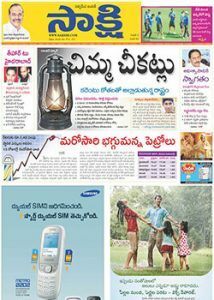 Sakshi is a Telugu daily Newspaper. Headquartered in Hyderabad and launched on March 24, 2008, Sakshi Telugu newspaper is one of the recent entrants into the news publishing market. It offers 23 multi-colored editions (one edition each for twenty-three districts of Andhra Pradesh & Telangana state). Talking about circulation, Sakshi is the second largest circulating newspaper in Andhra Pradesh & Telangana with distribution figure of quite 14,00,000 copies – as per the Audit Bureau of Circulation (ABC) figures. Hyderabad City – (308,017 copies), Vijayawada City – (112,243 copies), Visakhapatnam City – (89,693 copies), Guntur – (89,409 copies), East Godavari – (86,549 copies), Chittor – (66,735 copies), Anantapur – (62,532 copies), Srikakulam – (56,382 copies), Kurnool – (56,196 copies), Karimnagar – (42,480 copies), Nalgonda – (39,915 copies), Warangal – (37,551 copies), Mahabubnagar – (35,834 copies), Nizamabad – (29,936 copies), Karnataka – (20,251 copies), Tamilnadu – (10,131 copies), Adilabad, Khammam, Krishna, Medak, Prakasam, Ranga Reddy, Visakhapatnam Rural, Vizianagaram, West Godavari, Kadapah.